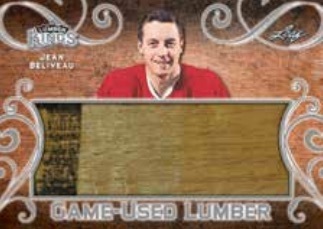 2017 Leaf Lumber Kings Hockey makes no secret of its intent, as the limited set is all about hockey stick relics. 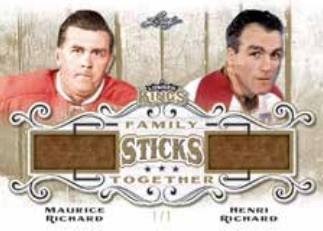 Similar to the 2016 edition, 2017 Leaf Lumber Kings Hockey promises four memorabilia cards containing stick pieces in every box. There are also signed relic versions which fall randomly and count among the box hits. 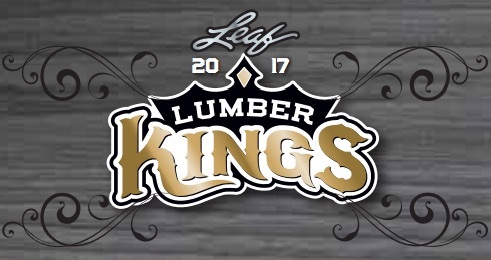 Featuring a wide mix of themed sets, the 2017 Leaf Lumber Kings Hockey checklist is more like a bunch of different inserts that are, of course, united by hockey sticks. 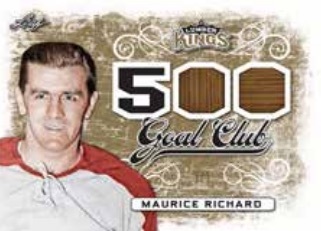 Easily grouped by single-player and multi-player sets, the memorabilia options for individual players include 500 Goal Club for the esteemed scorers in hockey history. Game-Used Lumber focuses on many all-time greats, while Game-Used Goalie Lumber works with the netminders. Perhaps most unique are the Nameplates cards, which showcase the player's name designation from the stick. There are also Lumber Kings options with several players on one card. Dual Family Sticks Together documents the genetic connections from league history, and Triple Blade naturally covers a trio of stars. Further increasing the totals are Fantastick 4, Original Sticks 6, Lumber Team Captains, with six subjects per franchise, and the eight-player Legendary Lumber Team set. Applying a signature alongside the stick piece, 2017 Leaf Lumber Kings Hockey also has autographs to chase thanks to the Twig Sigs line. 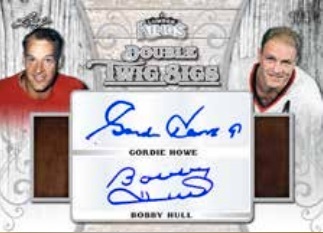 These come as single-player editions, as well as Double Twig Sigs cards. Although no exact number was provided, the 2017 Leaf Lumber Kings Hockey production is less than 150 cases (1,500 boxes). These are mock-up images. Designs and contents subject to change. PARALLEL CARDS: Silver #/9 (Lemieux - #/5*), Platinum #/5 (Lemieux - #/3*), Red #/3, Emerald #/3 or #/2, Purple #/2, Gold 1/1, Printing Plates 1/1. PARALLEL CARDS: Silver #/7 or #/5*, Platinum #/5 or #/4*, Red #/3, Emerald #/3 or #/2, Purple #/2, Gold 1/1, Printing Plates 1/1. PARALLEL CARDS: Silver #/10, Platinum #/7, Red #/4, Emerald #/3 or #/2*, Purple #/2, Gold 1/1. PARALLEL CARDS: Silver #/7 (Mahovlich - #/4*), Platinum #/5 (Mahovlich - #/3*), Red #/3 (Mahovlich - #/2*), Emerald #/3 (Mahovlich - #/2*), Purple #/2, Gold 1/1. 15 cards. Serial numbered #/17. PARALLEL CARDS: Silver #/10, Platinum #/7, Red #/3 (Cards #10,13 - #/5*), Emerald #/3, Purple #/2 (Cards #10,13 - #/3*), Gold 1/1. PARALLEL CARDS: Silver #/10 or less, Platinum #/7 or less, Red #/5 or less, Purple #/3 or less, Emerald #/3 or 1/1, Gold 1/1. 6 cards. Serial numbered #/17. PARALLEL CARDS: Silver #/10, Platinum #/7, Red #/5, Purple #/3, Emerald #/3, Gold 1/1. PARALLEL CARDS: Silver #/6, Platinum #/4, Red #/3, Purple #/2, Emerald #/2, Gold 1/1. My review may be somewhat askew based on the fact that I perfer stick relics more then I do either jersey or patches when it comes to Hockey collectibles.